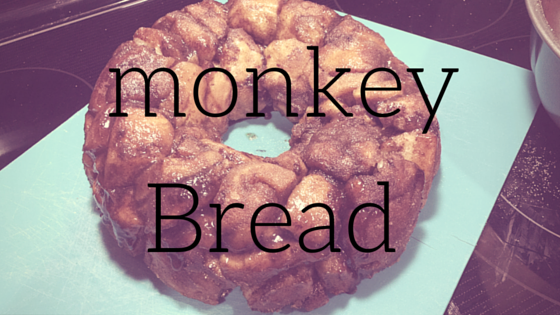 Have you ever had monkey bread before? You either (a) have eaten it and love it or (b) have no idea what I’m talking about. I used to fall into the latter category,until yesterday morning so let me share what this delicious recipe is. This sweet, gooey pastry is made from little balls of dough rolled in cinnamon and sugar then baked in a bundt pan. To eat it, you tear the bread piece by piece just like a monkey would. There are tons of recipes out there to make monkey bread from scratch but I chose this recipe because it is super quick and easy. Once you smell the ooey gooey cinnamon sugar bubbling in the oven, you’ll know you made the right decision! Today I am sharing this great recipe I found because if your anything like me you scribble recipes down on random pieces of paper tucked in books that you are never ever going to find when you need them or you have random screen shots cluttering up your smartphone storage space. Here are some other great breakfast ideas if your stumped for ideas. An easy to-to treat for holiday brunches! Enjoy!! 1. Preheat the oven to 325F. Lightly grease 12-cup fluted tube cake pan. 2. Combine the cinnamon and sugar in a large Ziploc bag. 3. Cut each biscuit into quarters (you will end up with a total of 16 biscuits) Place them in the bag and shake to coat. 4. Arrange the biscuit pieces in the pan. Mix the butter and brown sugar, then pour it over the top of the biscuits. 5. Bake 30-35 Minutes until golden brown. Cool in the pan for 10 minutes, then flip the pan over onto a serving plate. Pull apart to serve! * add 1/2 cup of raisins, pecans and apple slices make a great add in. This ooey gooey bread was a huge hit with our family now I just have to make sure not to make it too much or the kids will get sick of it. I made this same yummy recipe a few months back. My kids devoured it! yummy! This would be a major hit in my house. Actually, now that I think about it, I would need to make two because we’d run out quick. Used to make this with my kids when they were little. Yummy! Monkey bread brings back memories. I used to make this with my mom when I was little. I see lots of folks saying this kind of thing. I’d love to try it! OMG I am drooling over this. I so want something sweet right now and this would hit the spot. This looks really tasty! I’ll have to add this to my list of recipes to try with my girls! 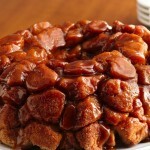 I have never had the pleasure yet of trying a monkey bread but looking at it now I am so gonna try it out too. Thanks for the recipe. Pinned this so I can make it. You just brought back some great memories for me with this post. My aunt (who passed away a few years ago) used to make this for us when we would come to visit her. It was one thing I always looked forward to. I’ve been wanting to make this bread for our family. I’ve heard yummy thoughts about it.